1:24 sectional exhibition model of USS Agerholm (DD 826) built for the Navy by Gibbs & Cox in 1949. 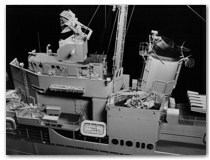 Click on the images above to view nearly 150 photos taken in 1949 by Gibbs & Cox of its 1:24 sectional exhibition model of the Gearing-class destroyer USS Agerholm, now on display at the US Naval Academy, scanned and presented here with the kind permission of the US Navy's Curator of Ship Models. A DVD-ROM containing the original high-resolution scans of these images will soon be available via this web site’s Ship’s Store. exceed in excellence its development at Gibbs and Cox. 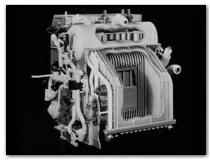 “Perhaps nothing is so characteristic of the [rapid progress in American engineering from 1918 to 1940] and the resulting complexity of machinery and equipment as the rise and perfection of the art of modeling. “Because of the extremely crowded conditions in the engine rooms of submarines, it had long been practice to make a ‘mock-up,’ as it was called, of the machinery in the engineering spaces. It would have been almost impossible to install all the machinery required for this operation if this had not been done, and it would have been quite impossible to install it in such a fashion that it would have been easily operable or easily accessible for repair. This building of models for machinery spaces was also developed at the Brooklyn Navy Yard and was employed there in connection with the design and building of the battleships North Carolina and Washington, the first battleships of the new building program. Nowhere, however, did the art of model building exceed in excellence its development at Gibbs and Cox, the designers of so many of our controversial destroyers. “Models for the machinery and other spaces of destroyers, and later for all vessels for which they were the design agent, were constructed so accurately to scale. 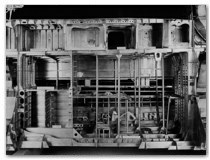 No piece of equipment or member of the hull of the model was installed until the drawings were approved by the appropriate Bureau of the Navy Department. The model thus became, in this respect, a progress chart for plan approval. The models were so accurate that it was safe for a draftsman to obtain dimensions from them, and it was much easier for the pipe shop to lay out its piping from the model than to construct it by laying templates in the actual vessel. The improved arrangement and accessibility of destroyers after the Mahan may be credited in great part to model making. Source: Bowen, Harold G., Ships Machinery and Mossbacks, Princeton University Press (1954), page 68.